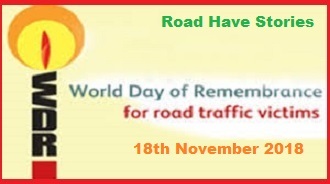 The World Day of Remembrance for Road Traffic Victims was observed throughout the world. The World Day of Remembrance for Road Traffic Victims remembers people killed and injured on the roads across the world, together with their families, friends, and others who are affected. This day also thanks to the emergency services. The World Day of Remembrance for Road Traffic Victims-2018 theme is “Roads have stories”.